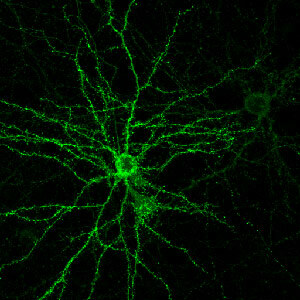 A cultured neuron with projecting dendrites studded with sites of communication between neurons, known as dendritic spines. By suppressing the Nogo Receptor 1 gene (NgR1) in older mice, scientists at Yale University have reset their brain to adolescent levels of plasticity, recreating a youthful brain that enables both learning and healing. The flip of a single molecular switch helps create the mature neuronal connections that allow the brain to bridge the gap between adolescent impressionability and adult stability. Now Yale School of Medicine researchers have reversed the process, recreating a youthful brain that facilitated both learning and healing in the adult mouse. By monitoring the synapses in living mice over weeks and months, Yale researchers have identified the key genetic switch for brain maturation a study released March 6 in the journal Neuron. The Nogo Receptor 1 gene is required to suppress high levels of plasticity in the adolescent brain and create the relatively quiescent levels of plasticity in adulthood. In mice without this gene, juvenile levels of brain plasticity persist throughout adulthood. When researchers blocked the function of this gene in old mice, they reset the old brain to adolescent levels of plasticity. 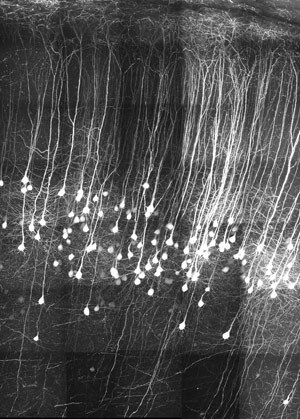 A 3-D reconstruction of neurons in the somatosensory cortex. Rehabilitation after brain injuries like strokes requires that patients re-learn tasks such as moving a hand. Researchers found that adult mice lacking Nogo Receptor recovered from injury as quickly as adolescent mice and mastered new, complex motor tasks more quickly than adults with the receptor. “This raises the potential that manipulating Nogo Receptor in humans might accelerate and magnify rehabilitation after brain injuries like strokes,” said Feras Akbik, Yale doctoral student who is first author of the study. Researchers also showed that Nogo Receptor slows loss of memories. Mice without Nogo receptor lost stressful memories more quickly, suggesting that manipulating the receptor could help treat post-traumatic stress disorder. The study was funded by the National Institutes of Health. Strittmatter is scientific founder of Axerion Therapeutics, which is investigating applications of Nogo research to repair spinal cord damage. Be the first to comment on "Suppressing NgR1 Returns Brain to Adolescent Levels of Plasticity"